If last week of food preferences didn’t publicly humiliate me enough, here we are with a even more disgracing one: our alcohol consumption. Since both Stefanie and I actually like indulging in (ehm) some drinks, and since we were officially entering Christmas Holiday at this point, we decided to track and draw the alcoholic beverages we would drink over the week. I really like beers. I mean, really. My boyfriend and I (and actually all of my friends here in New York!) really enjoy winding down after work with a beer or two, and since we eat out (ehm) every evening, we would also have a couple of beers while eating (ehm). I usually drink only beers; but being on vacation pulled me off my usual drinking routine and I found myself indulging in some wine, liquors and cocktails that I wouldn't ordinarily drink; though beers are still winning on my postcard. - what I am drinking? - how much do I like it? - am I sharing it with my boyfriend? - did I have it before? I also took additional notes about who I was with and what we were doing (because I never drink on my own, fortunately), if it was a draft, bottled or canned beer, and how long my drink lasted (because yes, I am also a fast drinker). I wanted my drawing to reflect not only the drinks I had but also the situations I were in, so I tried to represent my data in a very detailed way. Since I never (never never) drink any alcohol before 6.00 pm (my body just can’t !) I drew a daily timeline that starts at 6.00pm and ends at 1.00 am: in fact, even if it was a week of holiday I never went to bed late. I never go to bed late. I've never been a stay-up-late person, my ideal evening (which happens very often and which you can picture from my drawing) is getting drinks and dinner with my boyfriend or with friends around 7.00pm (if not earlier), be on the couch by 9.30 or 10.00, and slowly calling it a day while reading or checking up stuff. So this is the premise for how to read this week. Every compound element in the drawing is a drink I had (hey! wait wait - many of them were shared with my boyfriend!). I found it interesting that sometimes we would order the second round a little before finishing our first round (getting used to slow waiters :)), and from my data I could also notice that the first drink I have in the evening usually last way less than the later ones. 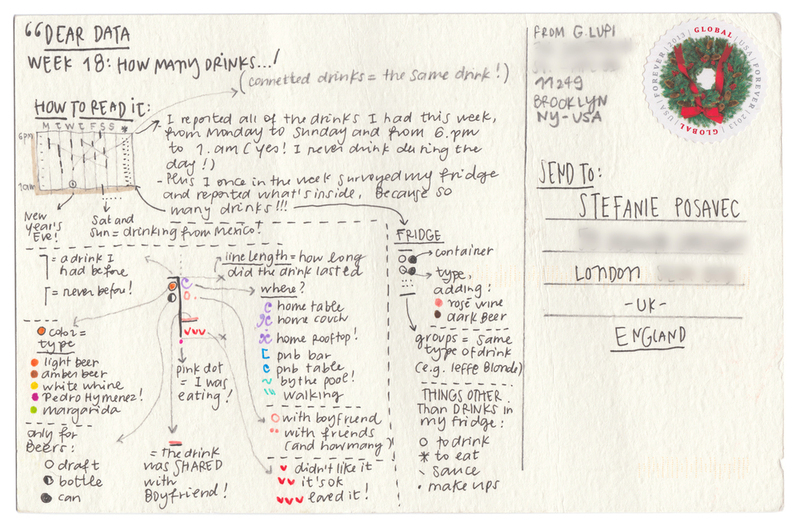 I like Stefanie’s postcard very much! I find her data collection very interesting and I could totally picture her in her different drinking-situations over the week! I also find the minimalism of her visual very elegant: I have to force myself to detail my postcards a little less!! Did I write how much I am loving Dear Data already? At the end of this week my boyfriend and I left New York for a week in Mexico, and I had the possibility to reflect upon my past months from a little far away and while on a relaxation mode. I've always loved drawing and data, and used drawing as my way of sketching my ideas out in any situation. I realized that maybe what I love the most about Dear Data is that it makes this passion of mine concrete: now the data-drawing gets to be the final result! It is the very final output and not just an intermediate phase that than would be re-done digitally. I have also been thinking about my profession and my daily job: as a design director in my company, the most of my time is dedicated to overviewing and reviewing projects, I help designers coming up with first ideas but then I more and more delegate the execution. Dear Data helps me to keep a contact with who I am as a designer; and I embraced this personal and side project that re-included a sort of subjectivity and human touch in the way I am doing data visualization. And drawing makes me happy! 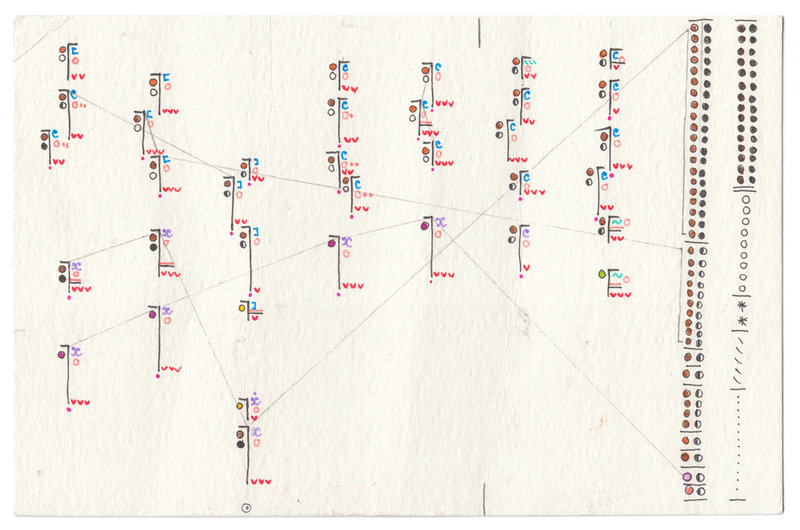 And also working on some permanent, kind of art-experimental project makes me happy! Drinking: the perfect thing to track over the Christmas holidays in the UK! I really enjoy the secular, celebratory nature of Christmas in England, and a critical part of that is being allowed to drink a Mimosa / Buck’s Fizz in your pyjamas with breakfast on Christmas Day. Anyhow, since this week took in some of the post-Christmas family visits and New Year’s Eve, I was curious to see how many drinks I would drink in this time period. I’ll be honest, this week has a bit of a performative aspect to it in that I have a feeling this was less about me tracking, more about a challenge. For the past few years I’ve been invited to celebrate Hogmanay (Scottish New Year’s Eve) in a lovely remote cottage in the Scottish Borders, patiently hosted by a friend’s parents and their geese, ducks, and chickens. For three days we eat lovely food, go on walks in the countryside, and build massive bonfires,and then for Hogmanay we create hand-crafted, slightly rubbish costumes for an incredibly obscure fancy dress theme (this theme was Medieval, I'm so pleased with my costume that I felt the need to post a photo of it below). We ring in Hogmanay in the aforementioned costumes, the parents graciously fade away, someone starts to dj, and the party lasts until the last man or woman standing. Obviously, quite a bit of drink is involved, so I needed to make a record of this. The first leg of travel to our Hogmanay holiday was a train from London to Newcastle, that left around 9-10 am. *Obviously* I had to have a drink on the train before 12 noon because 1: I thought it would be a good addition to the data and 2: because I was on holiday, so why not? The next leg of travel was a large taxi to the house included lots of celebratory sparkling wine (if you aren’t driving, you can drink in cars in the UK, don’t worry Americans, it’s all above board here). And so it began. I'm quite proud that there was no data void here! I can see that I am able to track when it really matters. I like this drawing, I feel like I was able to record a good amount of information on this card in a relatively simple way. One of my favourite parts is the black line intersecting the card: this is the dividing line between the times it is socially- acceptable and unacceptable to drink (in my mind, not sure what the ettiquette books say). I wish the scale of drunkenness from 1-10 was more visible, however. This drawing is one of my favourites. Giorgia and I obviously have different standards when it comes to drinking, as she doesn’t start drinking until 6pm, whereas I think noon is acceptable! Also, I knew before this week that Giorgia mainly only drank beer, but I was so surprised at how much beer she keeps in her fridge that I asked for photographic evidence, as I didn’t quite believe it. Ok, I'm more proud of this than my postcard. My costume for the medieval theme: a plague-infested rat (note the fleas).... fabricated with cardboard and various stuff from around my house, powered by cava and Aperol. I think this is pretty impressive.